One of the rewards of foreign travel are the good people you sometimes chance upon. The last time I was in South Korea, a woman showed me how to shop at a local bakery (“First, you take this tray…”). In Taiwan, a girl noticing my struggles with my backpack offered me her seat on the Taipei subway. Yet in my three-plus years in Thailand, I’ve experienced this kind of no-strings-attached generosity perhaps a handful of times. There seems to be something in the Thai DNA that prevents them from having empathy for anyone outside their immediate circle of family and friends. It’s little wonder then that the “haves” of this nation (the so-called Yellow Shirts, a political minority centered in Bangkok) have so little sympathy for the rural folk (the Red Shirts), seeing them not as fellow countrymen, equally deserving of a say in how the nation is to be governed, but as undeserving rubes living off rice subsidies and other handouts. Dirty tricks such as judicial fiats and army takeovers are therefore perfectly acceptable means of nullifying the power the Reds wield at the voting booth. Which brings us to the latest struggle. After a second coup in less than a decade, the latest Generalissimo In Charge has announced it will be at least fifteen months before another election can be held. In the meantime, there will be a focus on “security and reconciliation” (rather strange bedfellows) followed by a temporary constitution drawn up by legal experts. To expect that the current bitter animosities between the Yellows and the Reds can be somehow tamed, then papered over (pun intended) with a fancy new legal document is an exercise in wishful thinking. One wonders if the ruling junta is truly serious, or simply using this as a ruse to blunt criticism and stay in power. 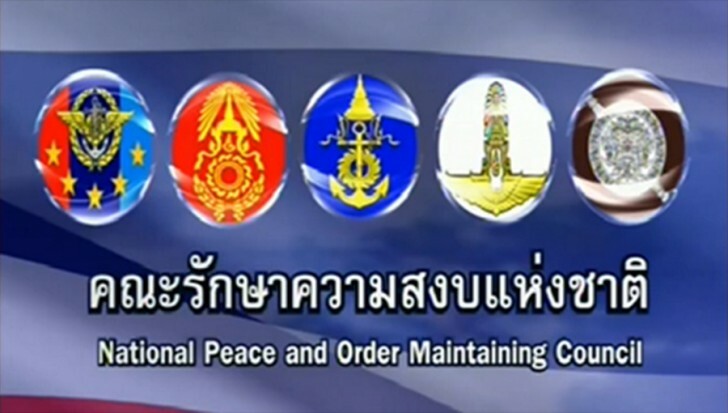 Ironically, it has been the Royal Thai Army that has allowed the tensions to escalate to the current boiling point. 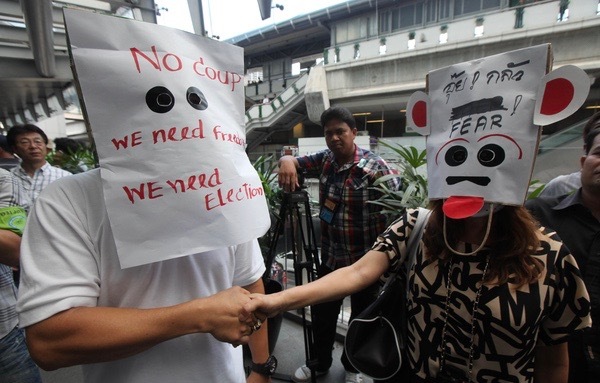 Back in January, when the Yellow Shirts blockaded major intersections in Bangkok, demanding an overthrow of the elected, legitimate government, the army did not lift a finger against them as the anger on both sides rose. It was only after the prime minister’s forced removal almost four months later, when the Red Shirts began threatening counter-demonstrations, that the soldiers actually took to the streets and martial law was declared. For the generals to now be portraying themselves to the outside world as fair and impartial rulers is laughable. It was the French Prime Minister of almost a century ago, Georges Clemenceau, who is credited with saying that war is too serious a matter to entrust to military men. If that is the case — and there is ample evidence to support the thesis — then it is even more true that the military should restrain itself from the management of civilian affairs. Thailand today is a country in name only; whose people fail to see themselves as part of a greater whole. No army is going to be able change that. In the past few days, the military takeover here in Thailand has grabbed worldwide headlines. The official rational for the move is to put an end to the political turbulence of the past six months, which has seen endless street protests, the forced resignation of the prime minister and some of her cabinet, and increasing fatalities as the violence threatens to boil over. Although the images coming out of Bangkok are replete with grim-faced soldiers and policemen, they are not actually guarding every street corner. When I had dinner Friday evening at the Terminal 21 Mall next to the very busy Asoke Skytrain Station, there were no uniforms or rifles to be seen. Just the typical crowd of commuters and shoppers along with wandering tourists deciding on where to eat. The only unusual scenes were the throngs of Thais waiting to ride the city buses, there being far fewer taxis available. As part of the crackdown, a nighttime curfew has been imposed, requiring everyone to be off the streets by 10:00 PM. I have not found this to be a personal imposition — being fifty-seven years old, I tend to be home by that hour regardless of what the authorities are ordering. For others, however, this is both frustrating and inconvenient. Strolling back to my apartment Friday night at 9:30 along Sukhumvit Road, there was a definite tension in the air as people scrambled to find a way to get home in a hurry. I made it to my comfy studio with fifteen minutes to spare as an eerie quiet descended upon my street, broken only by the occasional car. Rather than being under martial law, it felt like the capital city had been abandoned. In a strange way, I kind of enjoyed it. Another move the army has made is to close down various media outlets. For the first couple of days, about one third of the cable channels I used to get showed only a colorful display from the “National Peace and Order Maintaining Council”. This included CNN, though I could still get news from the BBC channel and my apartment’s internet connection was not affected. For the time being, I am not going to make any drastic moves such as a harried midnight flight out of the country. Instead, I’ll continue to keep a low profile and follow the rules, quietly going about my daily routines like everyone else. I do not feel threatened or even inconvenienced — at least not yet — and my feeling here is that it’s best to wait and see what unfolds in the next couple of weeks.